It is almost 2:00 am and here I sit blogging. In 9 hours I am supposed to present the Mother's Day message and I am in full panic mode. I have it prepared. That's not the problem. The problem is that when I look at it my mind goes blank and the words blur together and I feel my blood rushing in my ears. I honestly don't think I can do this. Thank you for all of the wonderful messages of encouragement. They mean more than you know. I am feeling so much more emotional than I thought I would. I keep telling myself that Mother's Day is just a Hallmark holiday. It is just like any other day. It shouldn't hurt any more or less but it does. My heart aches for my Emma to be here with us on Mother's Day. I feel the sting of her loss all over again. To not be able to do her hair and put a pretty pink bow in it is just so wrong. To not push her wheelchair over to church in the morning makes the walk so much longer. To not see her sweet smile and hear her laugh makes me want to scream in pain. THIS IS SO WRONG! SO UNFAIR!! I am angry at the unfairness of it all. To add to it all, we can't find Allie's sister ring. We had it made for her the week Emma died with both their birthstones set in a heart. She wears it every day. She took it off to go swimming and it fell out of Dean's pocket. He is upset that he lost it and she is sad to have it gone. She said, "God knows where it is." She's right but I hope He shows us! Anyway, I'm not sure what will happen in the morning. I don't know if I will be able to do this. I am trying to put it in God's hands and trust Him. Easier said than done. I don't want to disappoint anyone. Story of my life. It is Sunday night and I've been thinking and praying for you throughout the day. I know whatever happened that you are an awesome mom. I have always admired your strength through many circumstances of your life. 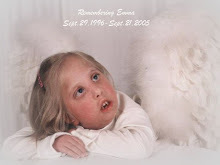 I think of Emma often and miss her smile. Know that you are loved and respected. I think of you all so often and miss you so. I pray for you daily and know that God is blessing your lives. I remember hearing you speak at Simon Road, and you were great, I miss those time and wish we would have had more time to be close but God had other plans for you. I look at my pics of Emma and me and tears fall still. You are such a blessing to all you come in contact with. My life is blessed by knowing you.